Fort Lauderdale Real Estate is a market of Luxurious Ft Lauderdale Waterfront Homes, Beach Area Condominiums, and an assortment of Condominiums, Townhomes and Single family homes for every life style and price point. When it comens to smaller Ft Lauderdale Condominium buildings, known as "boutique" buiding few stand out as the most special of properties as does the Harbourage Place Condo, of the Harbor Beach area of Fort Lauderdale Beach. Read more about Harbourage Place Condominium. 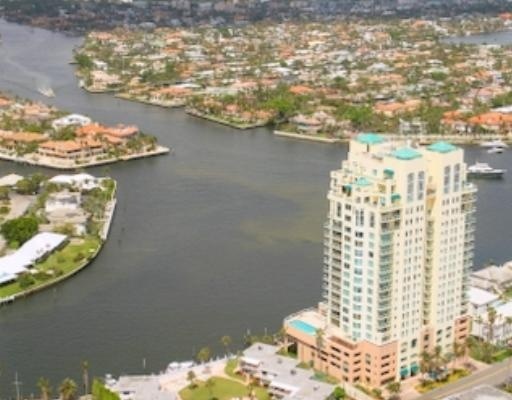 Luxury, On the Intracoastal Harbourage Place Condominium is located right on the intracoastal near Lake Sylvia and the beautiful Fort Lauderdale Community of Harbor Beach. The distinctive tower features views of both the ocean intracoastal and all of downtown Fort Lauderdale. The building does have numerous docks on the intracoastal that are all owned by residents and do come up for sale or rent to other owners. The Harbourage Condominium features some of the largest condominium units in the Fort Lauderdale condo market and can be viewed as a single family home in a hi-rise community. With units ranging from over 3000 sq. feet to over 6000 sq. feet, some units are designed as two story townhomes in the sky. The property features impact glass, a beautiful pool deck with hot tub, community room, and health club, as well as 24 hour security. If your looking for a well managed building in a beautiful area of Fort Lauderdale, Harbourage Place Condominium is a must see when it comes to Fort Lauderdale luxury condominiums. Eric Miller and Associates, are always available to help you buy or sell real estate in the Ft Lauderdale area and will be happy to show you Harbourage Place Condominium, you can email or call us directly at (954) 383-8170.